"This movie footage was not included in my book. After a careful, frame-by-frame analysis of this film we have concluded this is an authentic, classified copy of one of the many movies taken in July of 1952. This film has mold and scratches in the frames (see above). The film has a flicker or pulse of light that was created during mechanical projection. At the end of this film, the color fades from age. 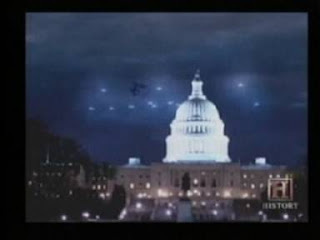 Also, the glowing light around the UFOs can be seen to bend around the Capitol as they pass behind it. This is not CGI." Exopolitics Radio with Alfred Webre is a weekly, Magazine format Exopolitical public affairs talk show, exploring the evidence and impact of intelligent, organized life in the Universe on our human society. Revere Radio Network: We welcome our new listeners on Revere Radio Network, which now carries EXOPOLITICS RADIO every Monday at 8 PM Eastern Time at www.revereradio.net. View CNN Coverage of the 2001 Disclosure Project Press Conference - May 9, 2001, National Press Club, Washington, D.C.